Evan Peters, Barry Keoghan, Blake Jenner, Jared Abrahamson, Ann Dowd. “The real” Spencer Reinhard, Warren Lipka, Eric Borsuk, Chas Allen, Betty Jean Gooch. What to make of the title? 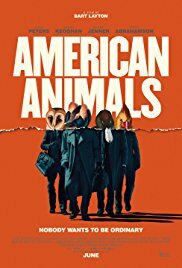 Animal animals? Human animals? Animal behaviour? And in America? It is a story of a heist, a true story from 2003, the setting a university in Kentucky. It involves four young adult students who share the idea of the robbery, stealing and selling some rare books kept in the University library, especially some manuscripts of the naturalist, Audubon (with some beautiful reproductions during the opening credits). It is meant to be something of an adventure, for them to be ‘special’ – which does indicate something of the basically amoral attitudes and perspectives of the young men, their lives and their future. But, the key element is interviews with each of the four, designated as “the real…”. And these interviews are intercut throughout the whole narrative, the audience watching the performers and experiencing drama, character development, the building up of the plot and the situations, while looking at and listening to the actual men. One is an art student who appreciates the books and sketches. He is played by Irishman, Barry Keegan. Interestingly, he is of the slight of build and rather timid compared with the “real” Spencer Reinhard who makes quite a good impression, rather taller and thinner physically, but articulate in his telling the story but also in his moral assessment. Evan Peters is Warren Lipka, the leader of the group, seemingly supremely self-confident, arrogant in manner, even shown in a trip to Amsterdam to make contact with potential buyers (did this actually happen or just his story?). The real Warren Lipka looks and sounds pretty self-confident (which is certainly not justified by how he actually acted during the heist). There is also the bookish Eric Borsuk (Jared Abrahamson)– not quite sure why he said yes to become involved. The real Eric is also rather bookish and theoretical. The getaway driver is a jock Chas Allen (Blake Jenner). The librarian is played by Ann Dowd, while the real Betty Jean Gooch is interviewed years later with some wise comments. Interesting to watch the interactions, the manipulation, different leadership roles – and the planning, diagrams, strategies. Even more interesting to see the fiasco dimensions of what actually happened – the presumptions and expectations versus the multi-mistakes of the planning. At the end, there are the personal assessments of each of the men, of their prison experience, and what it has meant for their lives. 1. The title, the focus, expectations? 2. The blend of narrative and drama with documentary interviews? The intercutting? 3. The credits, the visuals, the sketches, the birds, nature, animals? The books by Audubon? The focus on the evolution of the animals, to the centre of America, to Kentucky? 4. The film claiming not to be based on a true story but actually a true story? The documentary aspect, the interviews with the real four, the presentation, older men, remembering and commenting on the past, on their exploits, revealing their characters, attitudes? The reassessing their behaviour after the events and after their imprisonment? The indication of their jobs? The future? 5. The plausibility of the plot? The four students, Kentucky, their friendships, contacts? Age? Their wanting to make something of their lives, to be important? The amoral attitude? Agreeing to the robbery of rare books? The focus on Spencer, his idea? His recruiting Warren, Warren and his leadership, his personality, contrasting with the more introverted Spencer? The recruiting of Eric, his bullishness, reluctance? The recruiting of Chas, the jock, as a driver? The audience seeing the personalities being interviewed and comparing with the actors in their performances and interpretation? 6. Spencer, art, his knowledge of the library, the setup, the librarian? The idea? His personality, ambitious yet retiring? His sequences at home, his parents and sister, family celebrations? His plans, exams, part? 7. The contrast with Warren, his background, self-confidence? Ideas, planning, strategies and tactics? His visit to Amsterdam, the contact with the art fences, the discussions, his manipulation, their agreement? The question as to whether this really happened, Warren making it up? The flashback to his being dropped at the airport and his being picked up? His pressure on the others? 8. Eric, bookish, retiring, his being persuaded to participate, his recurring hesitations? Cautions? The contrast with Chas, not involved in the robbery except for the driving, the getaway? 9. The interaction between the four, the details of planning, diagrams and photos on the wall? Warren taking control? The others contributions, agreement? Exams as their alibis, showing them at the exams, present, leaving? 10. The issue of the librarian, not wanting to injure her, Warren taking responsibility? 11. The details of the actual robbery? The decision to be disguised as old men – and the indication of these themes during the opening credits? The make up, the arrival, as a group, their demeanour, the appointment with the librarian? The beginning of fatal flaws? The librarians having a meeting and their having to abandon the plan to the next day? 12. The next day, going as themselves? Chas ready with the car, Spencer, his reluctance, wanting to pull out, yet with the binoculars and being the lookout? Eric downstairs, waiting for the call from Warren? Warren, going to the library, the people in the library, the librarian, her opening the door, the appointment, the conversation? Looking at the books, their beauty? Calling Eric, his coming? The taser, overcoming the librarian? The resistance? down the stairs? The getaway car? 14. The consequences, the recovery of the Audubon? The police investigations? Their holding onto the two books? Going to the dealer in New York, her admiration for the books, asking them to wait? 15. The police, finally rounding them up, the court case, their imprisonment? The sentence for seven years? 16. The poor preparation despite their ambitions? The touches of the witless? Their motivation, amoral stances, crime and their wanting to make their mark? The repercussions on their lives and on the future?